ADHD seems to be misunderstood and get a bad rap from people who don't actually know much about it, so I'm here today to throw my hat in the ring and clear up a few misconceptions. I've heard comments from many quarters about the tendency these days to "throw around labels" and "bung kids on medication". In some circles it's rumoured that ADHD isn't even a thing - that it's made up - because apparently "French children don't get ADHD" (the same way French women don't get fat. Yeah right). Some people have the idea that ADHD is a convenient excuse for the bad behaviour of children who, in earlier generations, would just be called "naughty". Sigh. Of course it's one thing to be able to sit up on a very high horse and spout theories, it's another to live with children who actually have that very real thing going on in their brains, which makes life and school so painfully difficult, for them and us as parents. I've heard it all. Heck, I used to think and say it all too, back in the days when I was blissfully unaware of just why my quirky kids were so emotionally explosive and tricky to parent. In my head (and maybe yours too) ADHD kids were the aggressive, noisy, hyperactive ones who disrupt the class and bounce off the furniture. I thought that Ritalin was a drug used to quiet those hyper-noisy-aggressive kids down, so they would sit quietly and be more manageable; I thought it was a type of sedative that turned naughty kids into docile ones. Now I know that all three of my delightful, energetic, creative, noisy, emotional offspring have ADHD (coupled with dyslexia*). This makes life very difficult at times, but we are learning how to manage it. Today I want to share what I've learned about ADHD (and Ritalin). I want to shed a little light from an insider's perspective, to help dispel some myths about this very common (but often misunderstood) condition. ADHD isn't made up. It's an actual measurable, testable thing. It's not an excuse for naughty behaviour and it's not the result of bad parenting. ADHD is an inheritable genetic trait, that is passed from one generation to the next, just like eye colour. If one of your kids has ADHD, chances are a close relative or parent has it too (probably undiagnosed). ADHD stands for Attention Deficit Hyperactivity Disorder. The "attention deficit" part of the name for this condition is a little misleading, as it suggests that the problem is an inability to pay attention. I've heard it said that it's probably more accurately described as "information overload syndrome." A person with ADHD is actually lacking filters in their brain. Information and stimulation all crowds in at once, all demanding attention, all seeming equally important. A child in a noisy classroom has to try and filter out the bird chirping out the window, chairs scraping, feet thumping down the hallways, the teacher talking at the front, the itch on the back of his/her leg - these things and more are all competing for attention at equal "volume". Sorting out what's important to pay attention to for a child with ADHD is extremely difficult. Keeping their ears tuned into the teacher's voice when there is so much else going on in the classroom is a huge challenge. And if what the teacher is saying is of no interest to the child, their brain switches off and goes to sleep. And when the brain is switched off it's so easy to get in trouble for doing daft things and for not listening. Similarly the hyperactive aspect of this syndrome is like having a car with no brakes. The "stop" signal in the child's brain doesn't work like it should. Impulsive and inappropriate behaviour is often the result of the brain's "brakes" not working properly. I can tell you right now that I had no clue any of my kids had ADHD, because they didn't fit the common perception of what ADHD is. Each one of my kids is affected by ADHD in different ways, and each child is different. One of them is barely hyper at all, which made the condition very tricky to pick up on. In fact it took three different lots of professionals over four years before we got a correct diagnosis! During that time school was a nightmare and we all suffered with not knowing why our son was struggling so much. Like most other conditions (e.g. dyslexia, aspergers) the severity of how it affects an individual is on a spectrum. Depending on the personality - and gender - of the child will depend on how the ADHD shows up and how much it affects their ability to learn and socialise. I have one child with inattentive ADHD who struggles mostly with listening and concentrating (but also with sensory overload and impulsivity); I have one child with hyperactive ADHD and one child with a combination of both. ADHD is most commonly diagnosed in boys, but that is because the behaviour that is most associated with ADHD (aggression, disruptive behaviour and hyperactivity) is more common in boys, who also have testosterone to contend with. The aggression/disruption factor is easily picked up on and investigated, like a giant red flag, whereas the struggles of girls with ADHD are less obvious - and more socially acceptable! Consequently most girls who have ADHD struggle away on their own, usually without anyone realising. My girl is super active - she was crawling at five months and walking at nine months. She was diagnosed with ADHD at age nine, and it all made sense then: the baby who wouldn't sleep and who broke her arm for the first time when she was 18 months old. She's a fearless adrenaline junkie, who is accident prone and has a pile of X-rays to rival any movie stuntman's. We keep a pair of crutches on hand in her wardrobe, because you never know when she'll trip over her own feet again. With my daughter's hyperactivity comes energy and enthusiasm that, when channeled the right way (rather than being squashed) is an asset to any team or class she is part of. She has a wacky sense of humour and talks non-stop. But is she aggressive or disruptive? No. Does her ADHD inhibit her learning? No. She just needs to move constantly and have plenty of outlets for all that energy. Consequently we haven't needed to put her on Ritalin. I know there are natural remedies and miracle cures for ADHD being touted all over the interwebs: Diet, vitamins, oils, you name it. I'm not dissing any of it. Heck, if it works, go for it! I've also heard, Whatever you do *gasp* don't put your kid on Ritalin! Don't you know it will turn them into a zombie? from more than one well-meaning friend. I say: don't knock it, til you've tried it. When my son was diagnosed with ADHD at age 12 (after struggling in school since around age eight) I didn't have a clue how Ritalin worked. When they suggested putting him on it, I recoiled in horror at the thought of drugging my child. "I don't want to change who he is, dull down his personality and make him like a zombie," I said to the doctor. "You won't, don't worry. It doesn't work like that," he replied. And then he explained to me how Ritalin actually works. Far from dulling down the child's personality and turning them into a compliant "zombie", Ritalin actually works by waking up the brain. Ritalin is a stimulant. It brings the brain awake so that the child can focus and listen to what the teacher is saying, and then, with their brain fully awake and engaged they can make better choices and stay on task. I asked the doctor, "Well, what about kids who go on Ritalin and lose their personality and turn into zombies?" He said, "That only happens if the dosage is incorrect." I can tell you right now, taking Ritalin has been like a miracle for our son. After struggling so much in school for so long, his self-esteem, attitude and behaviour was of course affected. He thought he was dumb. At school, he was lost. (Not helped by undiagnosed dyslexia, which went along with it, but which wasn't picked up on because the ADHD messed up the test scores). When he was given the "attention test" to confirm the diagnosis of ADHD, he scored in the "impaired" range for listening skills. He simply couldn't take in verbal information. He may as well have been deaf. We started him on Ritalin and within a few days, both he and the teacher could see a huge difference. He came home and said, "Mum! I learned something today!" A month later he re-took the attention test, and scored in the "superior" range. He can now learn. He will be able to get through school and achieve his potential. He is at high school and coping with homework; meanwhile he's achieving in all his subjects and I'm getting comments from teachers like: "he's a credit to you". He's on a slow-release tablet that lasts from 8am-4pm. It's out of his system by the time he gets home from school. He is anything BUT a zombie. There has been no change in his personality at all - except that he's no longer frustrated and hopeless and feeling like he's dumb. He can learn and achieve. ***UPDATE/DISCLAIMER: When Ritalin works, it really works. But you won't know unless you try it, how it will affect your child. The good thing is that if you try it, you'll know pretty quickly, within days, if it's effective or not. And it's out of their system within eight hours of taking it. We were desperate and so gave it a try and it worked for us. Everyone's body chemistry is different, so meds affect everyone differently, just like with anti depressants. It's not an exact science, just trial and error. It might help with no side effects like it has for us, or it might not but you'll know pretty quick if it does or doesn't, and it's worth trying, IMHO. Recently our youngest son's primary school called me in and asked me to get him assessed for ADHD too. They'd been doing clinical observations in his classroom and watched him struggle for hours trying to control his body, stay on task, listen and learn. Trying - and failing. "He's not being 'naughty'", they said. "He's really trying. He just can't sit still/listen/remember what the teacher said/stay on task..."
(We already know he's dyslexic and gifted, so this was like, wow, really??? this too???). Sure enough the tests come back: ADHD confirmed. My youngest lad is super-smart but hates school with a vengeance. And now the ADHD diagnosis on top of everything else explains why he finds school so painful, so difficult, so exhausting. It was at the same age (8) that our eldest really started to struggle, and we began to tear our hair out, unsure what was going on. Unsure how to help. But now we know, because we've been this way before. Did I hesitate to put my second son on Ritalin? No, I did not. I know that this little white pill can help my lovely clever boy achieve his potential. He tells me, "Mum, I'm more patient." His teacher can see the difference too. 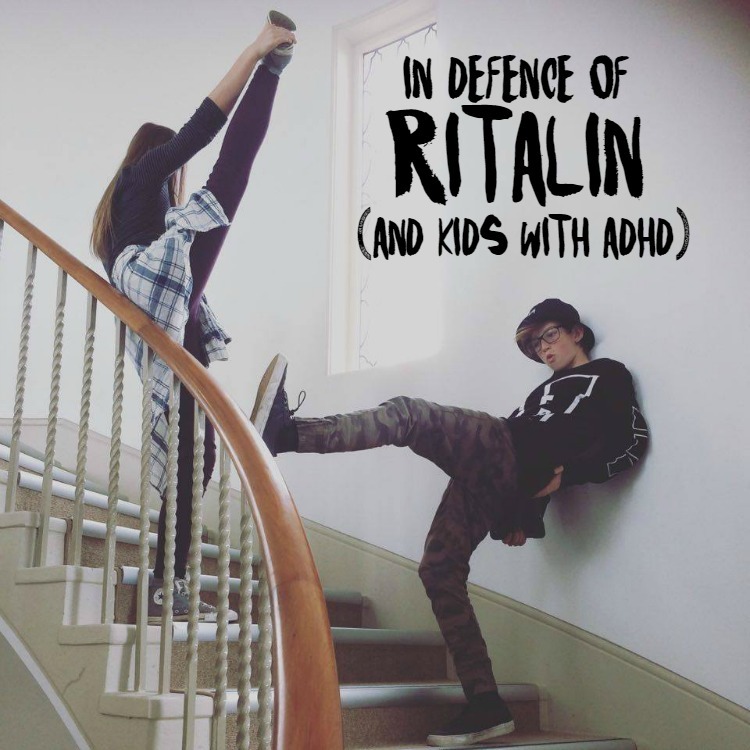 So here I am, sticking up for Ritalin, which is helping my boys navigate the rough waters of school with ADHD. And I'm sticking up for kids with ADHD, everywhere. They're not naughty and their parents are not slack. We just need your kindness and understanding. Because parenting kids with ADHD is bloddy hard work. Does any of this sound familiar to you? I'd love to hear from other parents of kids with ADHD. How do you manage things? Ritalin - or not? What has been your experience at school? Pictures in this post taken from the pages of the sweetest book about ADHD ever: "All Dogs have ADHD", by Kathy Hoopman. Title image taken by me of my two eldest darlings on stairs to the roof at Deco in Titirangi.